OFFICE IS ON THE EASTERN END OF THE GREEN ISLAND BRIDGE, IN THE RIVERFRONT OFFICE BUILDING, AT THE CORNER OF 4TH ST AND FEDERAL ST, 1ST FLOOR. ENTER VIA PARKING LOT ENTRANCE ON FEDERAL ST, PARKING IS FREE. The Troy Social Security office is located in Troy 12180. The following page includes information for this location like the office phone number, hours of operation and driving directions. If you have any interests or comments about your retirement benefits or are interested in making an appointment, call the following Troy Social Security office. The Troy Social Security office is located at Troy 12180. The New York SSA handles different federally run programs like retirement, SSI, Medicare and disability benefits. The following page contains available contact information for this location such as the Social Security office phone number, hours of operation, and driving directions. 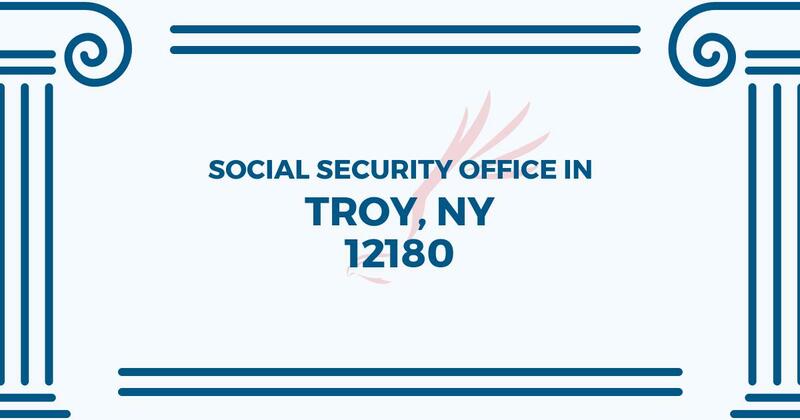 If you have any concerns or requests concerning your retirement Social Security benefits or interested in planning an appointment, call the following Troy Social Security office.